Heat grill. In small bowl, combine chili powder, cumin, 1 teaspoon brown sugar and ground red pepper; mix well. 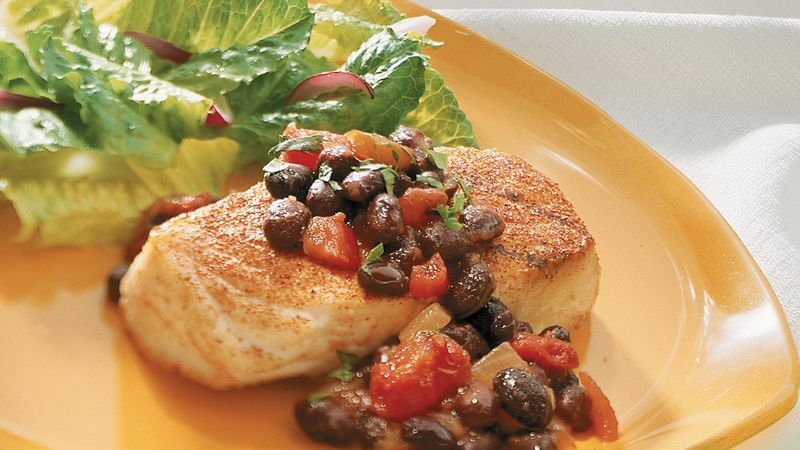 Place halibut on large plate. Brush both sides of fish with lime juice; sprinkle both sides with chili powder mixture. Let stand at room temperature for 10 minutes to marinate. Meanwhile, in medium bowl, combine all salsa ingredients; mix well. When ready to grill, carefully oil grill rack. Place fish on gas grill over medium heat or on charcoal grill 4 to 6 inches from medium coals. Cook 10 to 14 minutes or until fish flakes easily with fork, turning once. Serve salsa with fish. If desired, garnish with chopped fresh cilantro. To broil halibut, place on broiler pan; broil 4 to 6 inches from heat using times above as a guide, turning once.